Hydraulic Gradient and Relative Excess Hydraulic Gradient Graphs, both for constant spatial volumetric concentration curves and for constant transport volumetric concentration curves, for a particle diameter of 1 mm, for uniform sands and gravels. Hydraulic Gradient and Relative Excess Hydraulic Gradient Graphs, both for constant spatial volumetric concentration curves and for constant transport volumetric concentration curves, for particle diameters of 0.1 mm, 0.2 mm, 0.3 mm, 0.5 mm, 0.75 mm, 1.0 mm, 1.5 mm, 3.0 mm and 10 mm particle diameters, for uniform sands and gravels. Hydraulic Gradient and Relative Excess Hydraulic Gradient, both for constant spatial volumetric concentration curves and for constant transport volumetric concentration curves, for a 1 mm particles, for graded sands and gravels. Hydraulic Gradient and Relative Excess Hydraulic Gradient Graphs, both for constant spatial volumetric concentration curves and for constant transport volumetric concentration curves, for particle diameters of 0.1 mm, 0.2 mm, 0.3 mm, 0.5 mm, 0.75 mm, 1.0 mm, 1.5 mm, 3.0 mm and 10 mm particle diameters, for graded sands and gravels. Limit Deposit Velocity curves and Bed Fraction and Slip Factor curves. The transition heterogeneous-homogeneous flow regimes. A comparison of 22 models based on Hydraulic Gradient and Relative Excess Hydraulic Gradient curves. A comparison of the Wasp, Wilson & SRC models with the DHLLDV Framework. 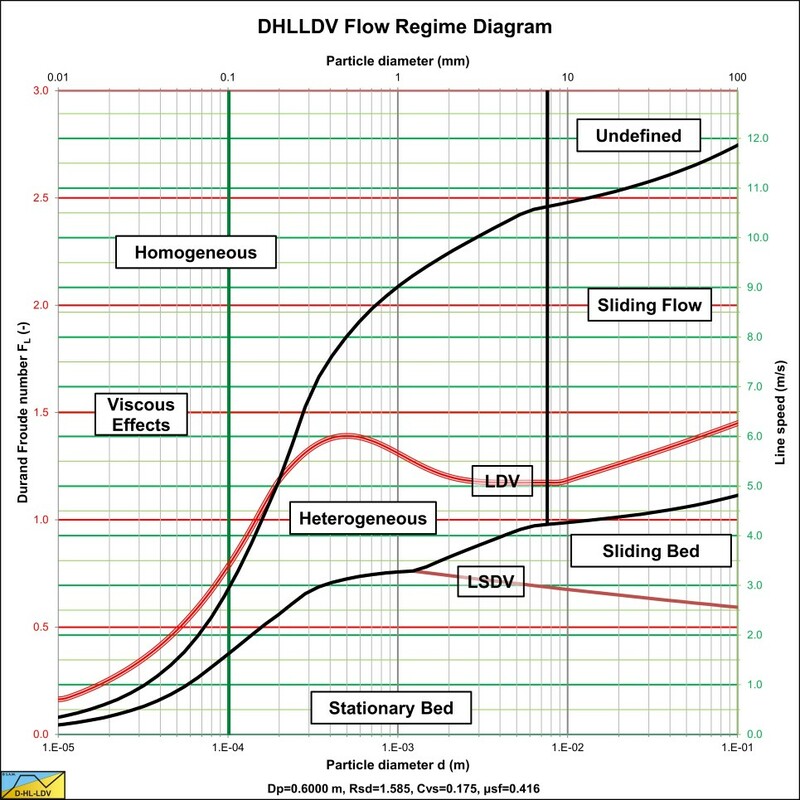 The flow regime diagram is based on the DHLLDV Framework. Since the DHLLDV Framework has sub-models for all the flow regimes, for each particle diameter the intersection line speed between two flow regimes can be determined. Connecting the intersection line speeds for a range of particle diameters gives a curve showing the transition between two flow regimes. The flow regime sub-models are based on the dominating physical behavior. So the sliding bed flow regime is based on energy dissipation due to sliding friction and the heterogeneous flow regime on potential and kinetic energy losses. The diagram also shows the Limit Deposit Velocity. Miedema, S.A., "The Delft Head Loss & Limit Deposit Velocity Framework". www.dredgingengineering.com. Delft, The Netherlands, 2012-now. Miedema, S.A., "Slurry Transport: Fundamentals, A Historical Overview and The Delft Head Loss & Limit Deposit Velocity Framework". Delft University of Technology, Delft, the Netherlands, June 2016. For the Limit Deposit Velocity a set of standard graphs is created for a spatial or transport volumetric concentration of 17.5%. At this concentration the LDV is at a maximum. For the slip factor and the bed fraction a set of standard graphs is created for a transport volumetric concentration of 17.5%. For the Wasp, Wilson & SRC models a set of standard graphs is created for a spatial or transport volumetric concentration of 17.5%.